We all love fall leaves! Many gardeners choose trees and shrubs for their garden primarily to enjoy their fall color. But what causes these glorious colors? Leaves are broad and thin, vulnerable to freezing. Trees protect themselves from winter damage by dropping their leaves each fall. Color change is the result of trees and shrubs preparing for leaf drop. 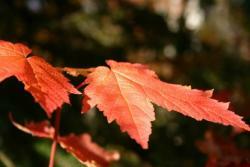 Three factors determine the color of fall leaves: daylength, leaf pigmentation, and weather. Although we often associate fall leaf color with frost, cold temperatures do not cause leaves to change color. In fact, hard frosts and freeze stop the process of color change and turn leaves black. Deciduous trees and shrubs are sensitive to changes in the number of daylight hours. Early in autumn, as the days shorten, they begin to prepare for leaf fall. A layer of cells forms at the base of each leaf, clogging and gradually closing off the veins that carry fluids into and out of the leaf. When the leaf is completely sealed off from the tree, it is ready to fall. Trees and shrubs do not all change color at the same time! Some species turn early, while others remain green until late autumn. This difference seems to be genetic and not the result of growing conditions. Pigments are responsible for the color in fall leaves. The amount of each chemical present in the leaf will determine its color. Different species are genetically coded to have or produce different amounts of each pigment. This is why elms turn brown, red maples turn scarlet, and hickories turn golden yellow. This chemical gives leaves their basic green color and is necessary for photosynthesis. It is not a stable chemical compound, so plants synthesize it throughout the growing season. Low temperatures destroy chlorophyll, allowing other pigments in the leaf to become visible. This chemical produces yellow, orange, and brown colors in a wide variety of plants like corn, carrots, and daffodils. It is present in leaves all season, but is masked by chlorophyll. When chlorophyll production stops in the fall, the yellow color can be seen. This water-soluble chemical is in the watery liquid of leaf cells and causes them to appear red. It is sensitive to the pH level of the leaf. If the leaf is acidic, the color will be a clear red; if it is more neutral, the color will be purplish. Anthocyanins are not present in leaves all summer. They are formed by a reaction between the proteins in the cell sap and sugar. They are not formed until the sugar concentration is high, sufficient light is available, and temperatures are above freezing. When they are present, they mask the yellow color from carotenoids. The leaves of some trees, particularly oaks, are high in tannin. The accumulation of tennins as chlorophyll disappears causes the leaves to be brown. The interplay of weather conditions during the period when chlorophyll production is decreasing has a strong influence on fall color. Temperature and moisture are the most important elements. Low temperatures destroy chlorophyll, allowing leaf color to become visible. Cold but not freezing temperatures promote the production of anthocyanins. Bright sunlight has the same effect. Dry weather increases the sugar concentration in the leaf, which increases the amount of anthocyanin produced. The most vivid colors are produced in fall leaves by dry, sunny days and cold but not freezing nights.